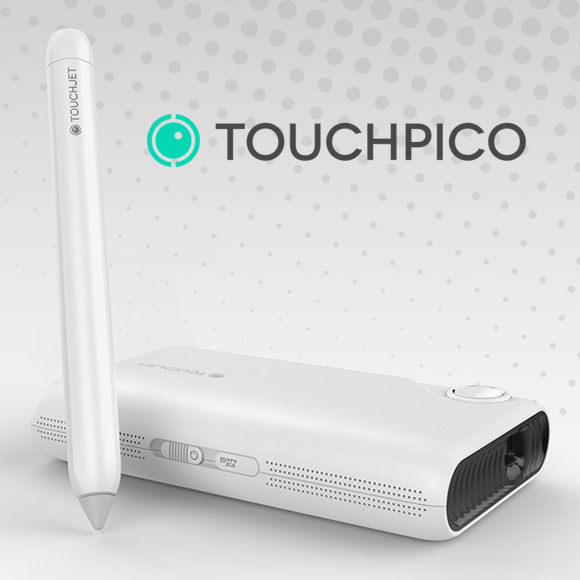 TouchPico is a new IndieGogo campaign that combines the cool factor of a pico projector with the power of its own built-in Android OS. That's a good start, but the real selling factor reaches into the realm of science fiction, with some smarts built into the provided stylus, the TouchPico can turn any surface, at any size, into a touch interface. The provided stylus emits an IR signal and the TouchPico projector has an IR camera. Sounds simple. Like I mentioned, this means that no matter what size you project to, up to 80-inches comfortably, the surface can be used as a touch interface. I won't go on too much here, I've gone over the particulars in my Android Authority post, head over there to get the details. I have mixed thoughts on the TouchPico. As the word pico implies, it is designed to be portable. I am sure that I would take it on the go for specific purposes, but I doubt I'd want to project my business meeting via Google Hangouts onto the wall of the coffee shop, like they show off in the campaign video. That said, I work from home, so portability is not as important to me. I'd give up a bit of wireless freedom in exchange for a more powerful light, more recent Android OS version or a lower price tag. What do you think, are interested in a touch anywhere projection Android device?